Is MDPV Making Its Way into Festival Pills Since Being Found in Australia? 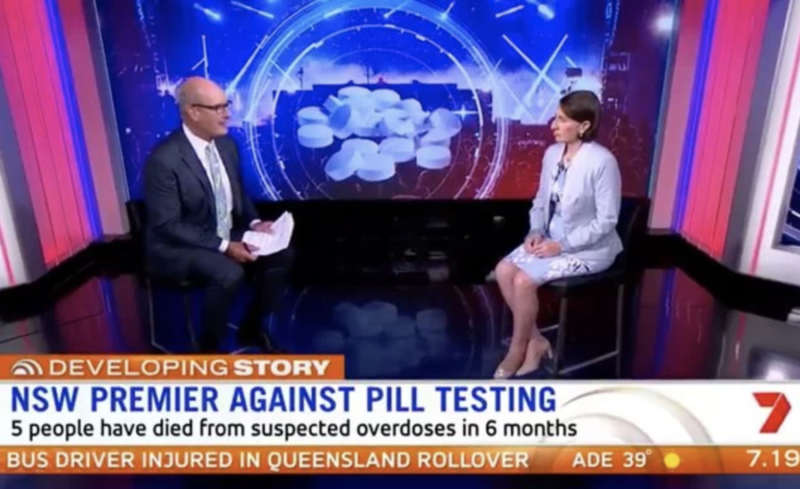 Seeing NSW Premier Gladys Berejiklian interviewed about festival drug deaths by Kochie recently, made it screamingly obvious how clueless and misinformed she is. Gladys has some “Reefer Madness” misconception that every drug you take is likely to kill you, and that the kids dying at festivals are dying because of ecstasy/MDMA. You have to wonder who the experts are advising her. The long and the short of it; we know prohibition does not work, kids will take drugs regardless of laws or policing, and chances are that the heavy handed presence of cops and sniffer dogs at festivals means that kids take their drugs in one hit when they see the cops, rather than in a more measured fashion if there was no police about to search them. So, it’s logical to think that the heavy-handed police presence is increasing the threat of overdosing rather than reducing it. But the craziest thing that was clear is that she doesn’t know toxic elements are sometimes being added to what people think are Ecstacy or MDMA, which is exactly why pill testing would save lives. Kids continue to die Gladys and your approach isn’t saving them. Logic suggests trying a different approach. Recent media reports have suggested a rise in a dangerous new party drug known as “monkey dust”. This is a slang name for the drug MDPV (3.4- methylenedioxypyrovalerone), as well as other members of the chemical class known as “synthetic cathinones” or “bath salts”. The effects of monkey dust are similar to other stimulants such as ecstasy (MDMA) and cocaine. Revellers may be using the drug on purpose as a substitute for these or may mistakenly think it’s MDMA. However, the potency and effects are different, and can lead to trouble. The recent seizure of more than four kilograms of MDPV imported into Australia suggests a market for the drug still exists. MDPV is a white crystalline powder in its pure form, but manufacturing impurities often render it from off-white to pale brown. It’s usually sold as a powder, powder-filled capsules or tablets. MDPV and other cathinones are often misrepresented as MDMA for sale due to similar appearance and some common effects. Laboratory testing of street pills containing MDPV shows it’s commonly mixed with other drugs. An oral dose of MDPV is estimated to be around 5-20 milligrams (compared to 100-150 milligrams for MDMA). The main psychoactive effects last two to three hours, and side-effects persist for several additional hours. Users report MDPV produces euphoria, feelings of empathy (although less so than MDMA), increased sociability, mental and physical stimulation, and sexual arousal. MDPV has been involved in dozens of deaths in Europe, detailed in a report by the European Monitoring Centre for Drugs and Drug Addiction, as well as in the United States, Australia, and elsewhere. For reliable identification, more sophisticated technology such as mass spectrometry or infrared spectroscopy, of the type drug experts are campaigning to take place at festivals, is required. In this regard, small, portable, and relatively cheap infrared analysers may be useful for on-site testing services. Could the Government be doing more to protect youth at festivals? Let us know what you think about this debate in the comments.